Welcome to Graduate Medical Education (GME) at UMKC. Our purpose is to provide an outstanding clinical and educational experience in a positive learning environment for residents and fellows in their chosen field of medicine. Our commitment is to train residents and fellows in compliance with Accreditation Council for Graduate Medical Education (ACGME) standards to: provide excellent Patient Care, obtain superior Medical Knowledge, understand and utilize Practice-Based Learning and Improvement, express superior Interpersonal and Communication Skills, exhibit Professionalism at all times, and understand and utilize System-Based Practice. Our school is nationally recognized for its innovative approach to medical education and exposes residents and fellows to team based patient care with opportunities to teach while learning. Our clinical affiliates provide diverse clinical and research experiences and have regional and national expertise. 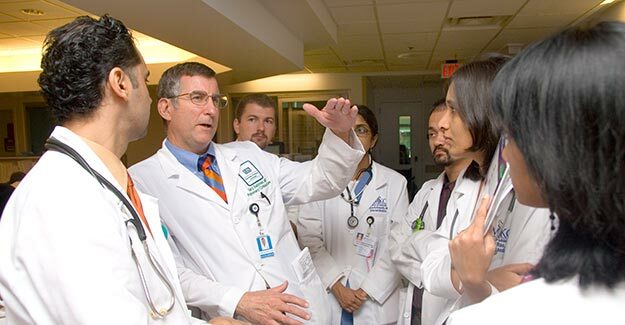 Learners, including students, residents, and fellows, are the focus of the School of Medicine. Faculty are engaged and enthusiastic teachers. Residents and fellows come from diverse backgrounds and experiences and are bright, hard-working, and passionate physicians in training. The GME Office considers it an honor and responsibility to advocate for residents/fellows, programs, and the learning environment. Please take the opportunity to review our post-graduate training programs, you will find the clinical experiences and educational curriculum exceptional. It’s a great time to be a resident or fellow at UMKC! To use our knowledge, skills and customer service to consistently serve our GME constituents with expertise, professionalism and courtesy.